The nights are drawing closer, crunchy leaves litter the pavement and my ability to socialize past the 6 p.m. is practically zero – autumn is here. I feel myself slipping back into my comfortable uniform of jeans, boots, a knit top and a semi-tailored coat and quite honestly, I couldn’t be happier about it. 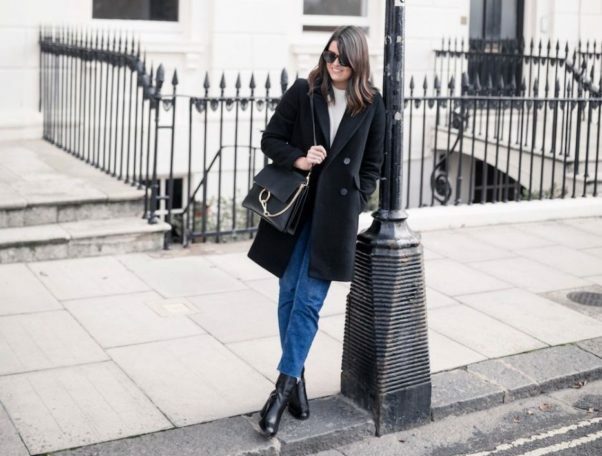 Autumn is here, and you can slip back into your comfortable uniform of jeans, boots, a knit top and a semi-tailored coat. Autumn is my homegirl, with the weather being crisp and bright and the right temperature that sometimes you don’t even have to wear a coat. Year-round sweater weather is the dream. If there was a place where this season appeared exclusively for 365 days of a year then I would move immediately. Of course it can get a little samey, so I have taken inspiration from my favorite Instagram gals to create outfits that I have never worn before. I thought I would share my most worn items in my current wardrobe, which if thrown on together create the uniform that I will be wearing for the next six months. Seriously – you are going to have to peel this off my hairy, non-shaven limbs come summertime. I am that person that still tries to wear boots on the hottest day of the year. Ain’t no one need to see these toes creeping out of a pair of flip-flops. My collection is small but broad, in that I owned a studded pair, a black flat pointy pair and a leopard print pair, but the one category that I was lacking in, was the black chunky heel. They are lush and feel high quality, so are worth the investment in my eyes. I have experienced no rubbing because the leather is quite honesty like butter, but it is taking me a while to get used to walking in such high shoes. They weren’t the cheapest purchase ever, but once you have got them in your wardrobe, I promise they won’t gather dust. I have noticed that out of the handful of jackets and coats in my wardrobe, that it is my pea coat that gets the most love. To me it’s the perfect coat. It’s wool-based, so it is thick and actually does a pretty good job of keeping me warm, and it is the length and cut that is just right. It is long, but not too long and the cut is fitted but not too formal, in the way that sometimes a trench or blazer can look a little too tailored. I wear it with everything, whether I’m popping out to pilates in my gym gear or trying to look a little more put-together for a dinner out. I have looked around and there isn’t much to choose from as everyone seems to be going nuts for trenches or jackets that really don’t look that warm. I am pretty sure you don’t need to hear me bleating on about how cashmere sweaters are the little luxury in your wardrobe that are 110 percent worth it, so I will keep it short and sweet. But there is nothing softer on the skin. In this post, I am wearing one I picked up last year. It was not as wallet-walloping as other options out there, but it washes well, and I love the colors and styles that they come in. I have been a skinny jean girl since my sixth grade days where if they didn’t look like they had been painted on then I wasn’t interested. The more I needed to unfasten my zipper after dinner, the better. I wanted them to look TIGHT. Thankfully the range of denim available these days is vast. I am all behind the fact that straight leg styles are having a moment, and I no longer have to disguise my unbuttoned waistband when I get up from the dinner table. I went through the whole summer without getting a case of “bag brain” – you know when you find the perfect bag and you can’t stop thinking about it and you spend the whole day doing math calculations in your head working out how you can justify such a ridiculous purchase that you never want your parents/other half/anyone else in the world to find out about? There just wasn’t anything out there that was floating my boat. But then autumn hit, and I am seriously considering selling two of my current line-up to make way for some new additions. For the autumn/winter season, I like my bags to be made out of a hardy, scratch-resistant leather and in colors that will make them easy to pair with any outfits; like black, blues and tans.